Help your skin bounce back with the La Roche-Posay Hyalu B5 Hyaluronic Acid Serum, an anti-wrinkle concentrate clinically proven to re-plump and repair skin in just one day. Made for dehydrated skin that is showing signs of ageing, the La Roche-Posay Hyalu B5 Hyaluronic Acid Serum harnesses the power of two types of pure hyaluronic acids, vitamin B5 and madecassoside, which work to plump, repair the skin’s barrier and activate skin cell renewal. The fresh, hydrated water-gel texture will leave the complexion immediately refreshed and will work both instantly and over time to reduce the look of wrinkles and fine lines, as well as improving radiance, loss of volume and elasticity. Use morning and evening after cleansing, to repair and hydrate the skin. At night, follow with a retinol night cream. Free from parabens and colourants. 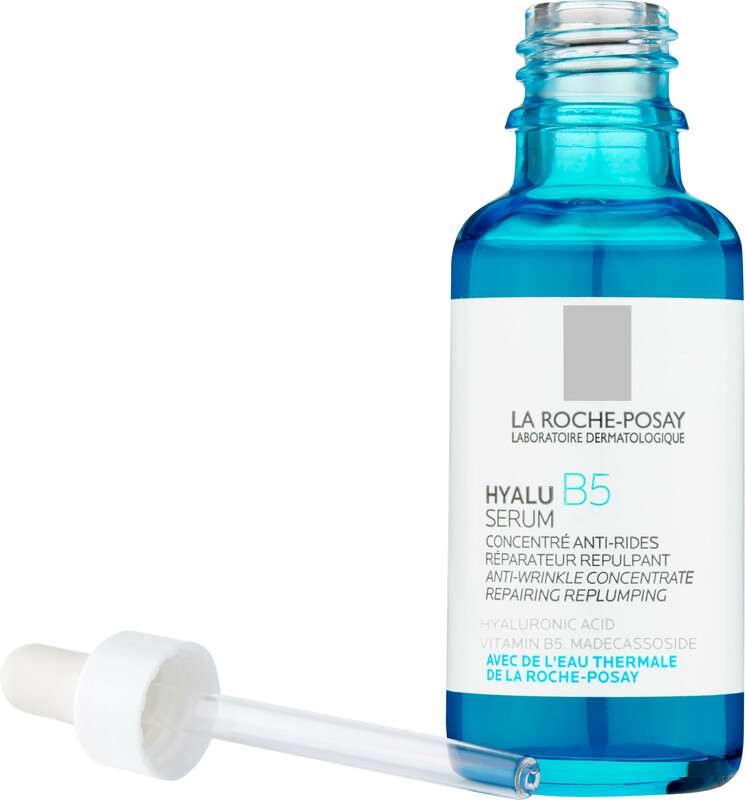 La Roche-Posay Hyalu B5 Hyaluronic Acid Serum 30ml is rated 3.8 out of 5 by 16. Rated 5 out of 5 by samandaj from Love this product This product is fabulous for dehydrated skin. At almost 50 years old products need to work a bit harder and this certainly does. Easy to apply smells refreshing, absorbs well. Followed with the matching moisturiser it leaves your skin feeling rehydrated, plumped and restored. Rated 1 out of 5 by Starr1954 from Not for me I love the la roche products. But this burnt my face really badly. I tried 3 times and got same reaction. I use the redermic day and night creams too...So though this serum is recommended before the night cream the combination is too much for me. It was very moisturizing and felt good before the burn . Looking at reviews it seems o.k for most people. Rated 5 out of 5 by RXRIVEXA from Best Purchase Ever I have been using this product for about 2 weeks now and have been enjoying it throughly. I would describe this product as a better, more advanced version of La Roche Posay's Hydraphase Intense Serum which I also love using. This product also gives you a healthy glow. Rated 5 out of 5 by Sass from Layering hydration This is a slightly gloopy serum. I layer it with a mist of hydration so that it has some aqua to work with and then leave it for a minute before topping with moisturiser. It's a quiet hero - it doesn't make me look or feel greasy but people have commented on my glow. At 48, skin products have to work a little harder, this seems to be a practical, no fuss kind of workhorse.